Tool Blog News Do Wood Scraps Make Good Notepads? Not really, but scraps are something we usually have around the shop or on the jobsite. Very rarely do I use real paper on the job for measurements or notes. What about when you are at home or in the office? You probably use those post-it notes that you can conveniently stick on anything and everything. The problem - they sure are ugly. Sure they can be seen from a distance, but that just means they are even more ugly up close. 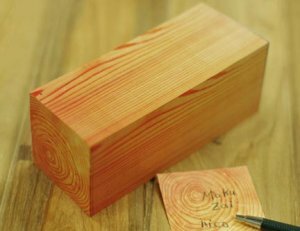 The Kakuzai Wood Memo Block is the answer to people tired of ugly notes and people who want a bit of style at their desks. It consists of a block of 1200 post-it notes printed on all 6 sides, made to look just like a block of wood - it even has growth rings. Wood made into paper, made to look like wood - brilliant. Too bad it cost around 30 bucks; at least the shipping is free.